Whether you are a homeowner, guests or business owners, an outdoor fountain can be a priceless accessory to beautify your surroundings. You can keep them in your private garden, front yard or the backyard, a public seating area, its alluring appearance, sound and the water rejuvenates people and infuses happiness and joy everywhere. Its calming effect on the body improves mental state of a person. So, if you are still into planning phase, then this article will prove useful to you. Learning about the benefits of these fountains would surely simplify your decision making process. Sound has a significant benefit on the physical, mental and emotional levels of a person. Where the sound of traffic can make one angry, a natural sound of water would benefit you on physiologic levels. The soothing sound of the running water creates a meditative experience in people. It helps in releasing stress from the person and makes them light, happy and recharged. Not just humans, but animals and birds also enjoy these fountains. It acts as a coolant in hot summer season and gives a significant amount of relief to them to beat the heat. It is also a clean and fresh source of water for them. This constant flow of water available at all the times makes them refresh and recharged. Also, unlike a still bowl of water, it is not required to empty them, clean and refill on a regular basis. Having an outdoor water fountain can do so much good for your business. Its aesthetical appeal and beauty will catch the attention of whoever visits your store. It can be considered as one of the ways to make new clients and revenue for your business. An outdoor fountain installed outside your store is a wonderful and captivating sight for several different businesses. Whether you run a salon, retail store, gym, yoga studio, restaurants, café etc. having an outdoor water fountain gives a competitive edge to your business. Water has the power to dissolve all the negativity present in the atmosphere. That is the reason why sitting near to the water makes one feel light and energetic. Where air conditioners remove negative ions from the environment, fountains on the other hand produces it. Flowing water adds negative ions to the environment which is good for enhancing levels of serotonin in the body and reduces depression. Fountains provide the much required humidity for drying environments and work as an air purifier system. It catches dust and harmful particles from the air and destroys it. Outdoor ceramic fountains bring a plethora of advantages to everyone. 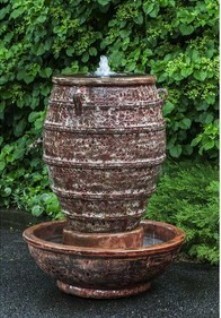 These fountains come in an astonishing range of sizes, styles, colors and textures. So, if you are looking for a fountain to match your existing decor or spice up your existing design elements, then they would prove to be a perfect accessory for you.